Why am I not awared the Curious badge yet when I'm as Curious as Curious George? Up to this day the Curious badge counter is saying I passed the requirements to get the badge, but it's not awarded to me yet. It went up to 5/5 a good while ago and then as of now 9/5. Am I missing something on why it's not awarded? 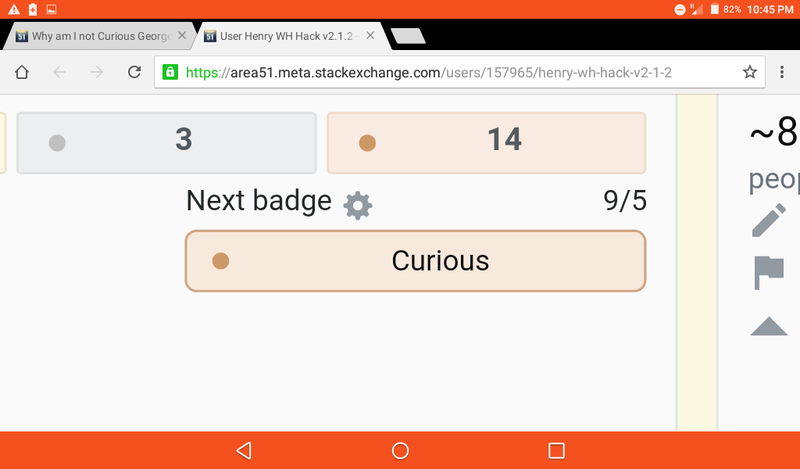 Browse other questions tagged area51-meta bug badges . Why are the Betas measured quantitativly when trying to provide quality? How come I'm logged in on discuss.area51 but not on area51 itself? How come I've earned the Curious badge with just 4 questions? Deleted two -3 scored questions but not got the peer-pressure badge. Why? Why different SE sites do not merge than their broader analog appears?